When Christine Cavallo's mother, Grace Rose, was diagnosed with Parkinson's Disease, it was an eye opening event for her family. When Christine was later diagnosed herself, she started Team Rockin' Roses to raise funds for Parkinson's research through the Parkinson's Unity Walk. On Friday, March 20, 2015, Christine will be hosting a fundraising event for her team, Rockin' Roses! They are asking for your help to bring the world a step closer to being Parkinson's free! Whether you are a child, adult, a fitness enthusiast, a dancer, or just looking to help, there will be something for you at the Rockin' Roses Parkinson's Fundraiser. There will be 1 hour of Zumba with Osy, dancing and partying with DJ Gigi, there will be video games for the kids, and plenty of food from around the world! Consultants from Jamberry Nails, Touchstone Crystals, and Mary Kay will also be on site. The fundraiser will be held this Friday, March 20th, from 7:00 pm to 10:00 pm at the Knights of Columbus (105 Grove Avenue, Maywood). 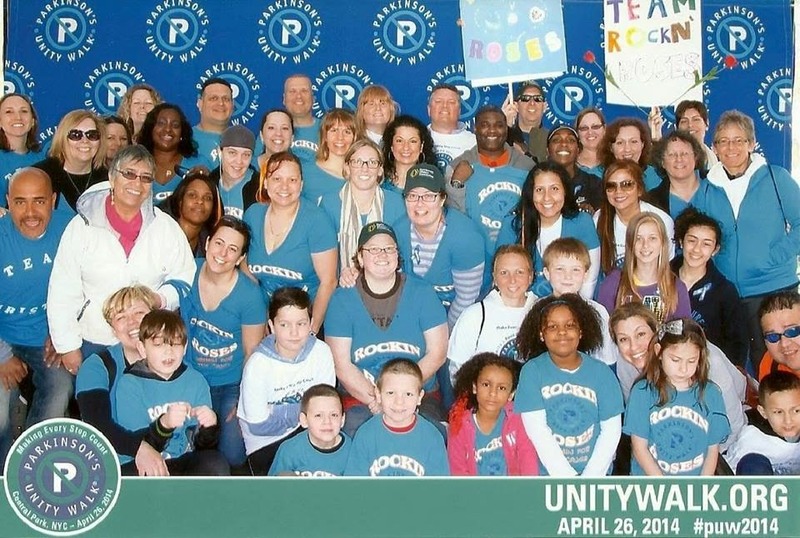 If you are unable to attend, but would still like to help, please visit the Rockin' Roses fundraising page for the Parkinson's Unity Walk! Is Zisa's record of lawsuits against the city about to be shattered? Hackensack has the motto, "A City in Motion." It seems to be more of "A City of Commotion." During Ken Zisa's downfall, more than 20 police officers sued alleging retaliation and civil rights violations. A report received by Hackensack Scoop seems to indicate that a new wave of lawsuits may be hitting the city thanks to a recent Internal Affairs complaint lodged by Captain Thomas Salcedo. You may remember Captain Thomas Salcedo as the former head of Internal Affairs under Ken Zisa's reign over the department. This is the same Thomas Salcedo who was made a mop of by attorneys during departmental hearings and depositions as he testified to falsifying his employment application and pretending to live at Captain Tomas Padilla's home on Bonhomme Street to meet residency requirements during hiring. Salcedo who was hired under a false application (something Prosecutor John Molinelli just indicted and tried an officer for) was only given a verbal reprimand by disgraced former Chief Ken Zisa. Salcedo is reported by several Hackensack Police Officers to currently be under investigation for improper use of sick time. It is also reported that he had a departmental hearing on the matter on Wednesday. Yesterday, reportedly as retaliation, Salcedo lodged an internal affairs investigation against 27 Police Officers alleging that they have improperly used their sick time to extend their scheduled time off. 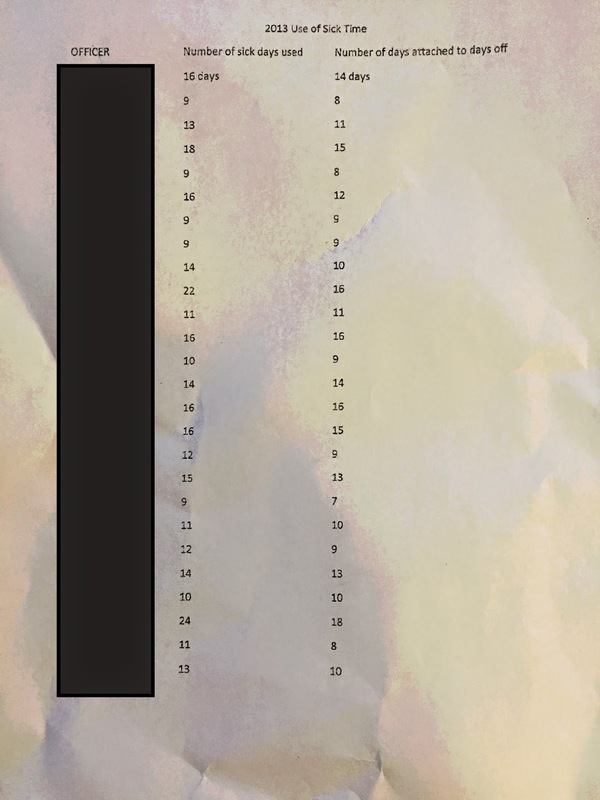 This antic will undoubtedly open the city up to a new round of litigation as it is reported that a local attorney has already been retained to defend these 27 officers against these accusations. There are already reports that more than half of these officers have consulted an attorney to bring action against the city and Thomas Salcedo for abuse of power and retaliation. I wonder if Captain Thomas Salcedo puts as much time and effort into police work as he does into scheming against and reviewing the personnel files and records of his fellow officers? By Salcedo's own admission on his complaint, he does not have access to these records. What made him think it was ok to access prior records to lodge this complaint? Perhaps that is the real matter Internal Affairs should be looking into (the improper access of records) especially in light of other officers personnel records, GPS records, and activity sheets improperly being disseminated to members of the media. 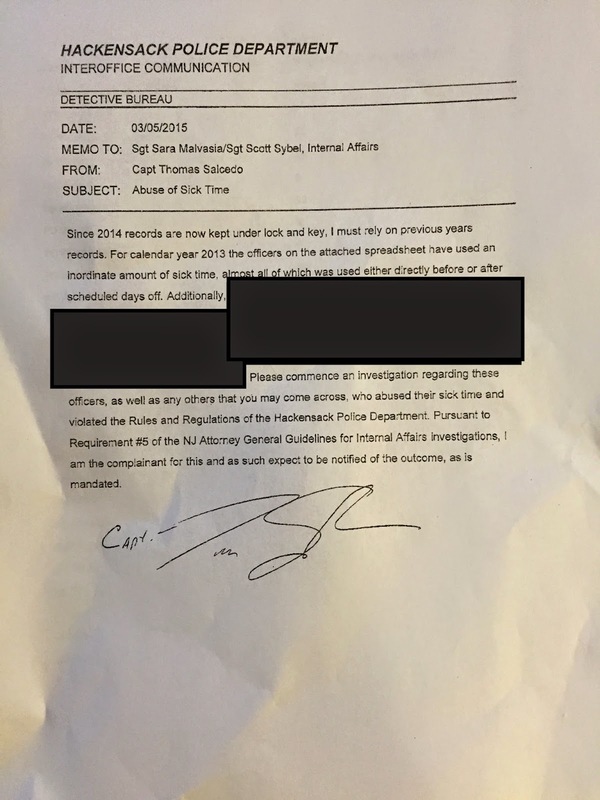 Another thing, police department records are not allowed to leave the building. How many hours did Salcedo spend on the tax payers' dime preparing the research for this complaint? As Chief of Detectives, what authority/permission did Salcedo have to do this research and access these records? If the City Manager and City Council are serious about putting an end to litigation and doing the right thing for the Hackensack Police Department, maybe they should buy out and force retire any subversive members of the department who continue to expose the city to litigation.